After the previous day’s success with boogie boarding the kids were eager for more. We started out nearby at the beach just down the path from our condo called Brenneke’s beach. It’s a small inlet, but popular wtih kids for boogie boarding. It turned out that the waves were too big for Roby and Cal to get a good ride. Ryan was able to swim further out and get some great rides on big waves. After having lunch in the condo we convinced the kids to go for a drive to the west to see some other beaches. We didn’t really have a destination but we knew we’d pass several beaches along the route. We ended up at a very long sandy beach called Kekaha just outside of Waimea. The beach had great sand — no lava rocks in sight — which has been rare on our trip. It looked rough but there was a life guard on duty and he said that it would be OK for boogie boarding so we decided to give it a try. It was only later that we realized that the lifeguard paid more attention to his dog and book than he did to the people on the beach. We tried to ride a few waves with the boogie boards, but it was immediately clear that we weren’t going to be able to ride any waves. They were huge. 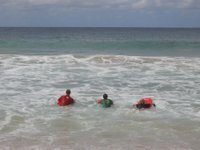 Rather than get discouraged the kids started playing in the waves trying to figure out how to go over and under before the break so they didn’t end up in the "washing machine." The water was extremely powerful and would slam you to the bottom if you got caught in the break. That happened a few times to all of us but the sandy bottom made it reasonably easy to recover. We played in the waves for over an hour and had a great time. We went for a walk down the beach and Ryan noticed a grey object in the sand and it turned out to be a baby hammerhead shark that had either washed up during a storm or been caught by someone fishing from the beach. Even though it was only a foot long it was fun to see the hammerhead and to feel its rough skin. After we finally burned out — literally our eyes were so red from the salt and sand we couldn’t see — we showered off and got back in the car. 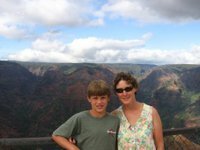 We drove up 14 miles and 4000 feet in elevation into Waimea Canyon which has been compared to the Grand Canyon. We were thinking about a hike that would take us to a mountain waterfall and pool that we could swim in. We stopped at a scenic lookout and it was amazing to see the size of the canyon and the red and green mountains. We finally got to the trailhead. We realized that we only had one bottle of water and Roby had couldn’t move his legs after all the abuse in the waves. We tried to coax him out for a short walk, but he couldn’t do it. It turned out to be for the better because it was a long drive back down the cayon and into town. We stopped at a supermarket to pick up food for the evening. The kids decided that they wanted to make something different. And that THEY would prepare the food. Ryan had learned how to make burritos on his canoe/camping trip so we bought the necessary ingredients for a gourmet dinner prepared by the kids. We also stopped briefly on the way back home at a sugar plantation to pull up a piece of cane to bring home. With all the no trespassing signs we felt like major criminals but we really wanted to see what a piece of cane straight from the fields looked like. 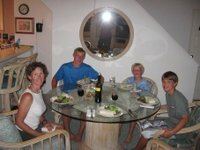 The dinner was great and we toasted our good time in Hawaii with sprite and wine with sugar cane sticks (we used the cane that we bought at the store rather than the stuff we pulled up from the field which turned out to be dry and dusty). 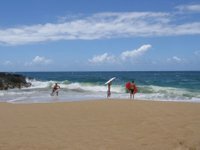 We explored the east and north shore of Kaui looking for good swimming and boogie boarding beaches. As usual we were surprised at the size of the waves. 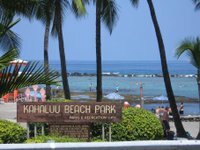 We our first stop was Kealia Beach which had many locals out riding the big waves with surf boards — no boogie boarders were in sight and it looked too intimidating to explore. We finally came to a nice wide beach but the waves still looked too big. 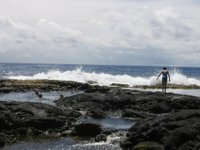 We continued up the road to the north shore and finally found a beach with a freshwater river running along lava rocks into the crashing ocean waves. We could swim in the calm waters of the river and play in the surge at the mouth. After a little while we got our nerve up to try swimming in the huge surf. We stayed close together and tried our best to stand up in the waves but we were smashed by the 10 foot swells. We still had fun although our parental nerves were a bit shot trying to keep the ducklings from getting pulled out to sea. We headed up the coast a bit more and made it nearly to the end of the road (which only goes to Ke’e). 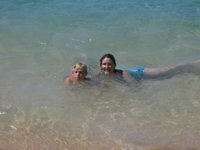 We swam at a better beach called Tunnels which is calm and set at the base of huge green mountains and cliffs. It was beautiful. We snorkeled a bit but the day’s quest was to find the best boogie boarding location so even this didn’t measure up from the kid’s perspective. We had a late lunch in Hanalei which included a great fish sandwich made with Marlin and "shave ice" for dessert. We stopped briefly at a farmer’s market to pick up some vegetables, flowers, and a pineapple for dinner. On the way back home we stopped again at Kealia Beach that had dozens of local surfers and we walked to the north end near a breakwater. We found a group of people boogie boarding and d ecided to give it a try. It was a huge success. Protected by the breakwater the waves were a manageable 5 feet or so with an occassional larger wave. The kids could boogie board close to shore where they could touch so it was much better. They were in the water for over an hour and had a great time. We drove back home around 7pm as the sun began to set. At home we took a quick swim in the pool and hot tub and then settled in for the evening. Our flight from Kona to Kauai was at 9:20 so it meant a relatively early breakfast and departure for the group. Even though we’ve done better than last year keeping bedtime reasonable, getting up at 7am is still tough now that we’ve settled into Hawaiian time. We dropped off the rental car and checked in very quickly. Going through security took a bit more time because for some reason we were flagged as "high security" — probably because we waited to book our tickets until the day before. So we got scanned and patted down before entering the outdoor courtyard where the gates are. We thought we had a direct flight to Kauai — at least that’s what the online reservation said. It turns out that we did have a direct flight, but with one stop in Honolulu. 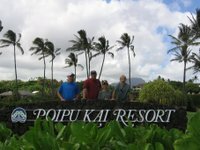 We landed in Lihue Kauai at about 11:30, picked up our new rental car and headed south to Poipu. We stopped for a delicious lunch at Taco Bell. We tried Burger King, but the line was too long. We got the impression that the locals had abandoned the tradition of the Luau and replaced it with whoppers and tacos. We made it to our condo Poipu within 20 minutes. Once again our condo is in the middle of a large development — all two story condos with similar appearance. The huge bonus for this place is that it has three bedrooms. It’s incredibly spacious which is a luxury that makes a big difference with the kids. It’s also not quite as fancy as our place in Kona so we’re not barking at the kids quite as much to be careful not to spill food. Our first goal was to get a sense of the area. After we settled in, we walked for our condo down through the well manicured paths to the beach. Unlike Kona we’re set well back from the water — about a half mile — so it’s a 5 minute walk to the water. It’s a nice walk so no one complained. We saw a few beaches and the Sheraton on the point. The beaches are nice, but fairly small and crowed compared with the other places we have visited. The wind and waves are also bigger than we expected given that Poipu is on the south side of the island. After visiting the beach we walked the other direction to see the Hyatt. Perched on the watch next to Shipwreck beach, the Hyatt is a luxury resort with every amenity. They have about six swimming pools – some of which have their own "sandy beaches" — and water slides for the kids. The view of Shipwreck beach is stunning. The main reception area and cocktail lounge is perched up on the cliff with the water sparkling in the background. They have a strict policy against non-guests using their facilities so the kids saw the whole excursion as just an exercise in frustration. We headed back to our condo and went for a swim in the pool, which in comparison to the Hyatt looked like a dinky footbath. We had dinner out for the first time since Honolulu and enjoyed some burgers and a great fish sandwich. We relaxed a bit before going to bed. During our explorations on Saturday, we discovered a place to rent kayaks on Kealakekua Bay. This seemed rather odd because all of the guidebooks and tourist literature say that the only way to go out in the bay is by guided tour or to rent a kayak in town and bring it down to the bay by car. So we were happy to find a much easier way. 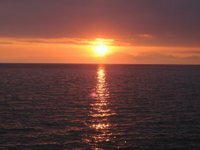 Kealakekua Bay is famous for a few reasons. It is beautiful setting with cliffs rising more than a thousand feet up one side and crystal clear blue water. It has great snorkeling. And it’s the place where Captain Cook, the great explorer who "discovered" these islands in 1775 was killed by the Hawaiians a few years later (As a side note, the Hawaiians liked him. They even thought he was a special god, but just before he was scheduled to leave they took his dinghy and he wanted it back. The ended up having a fight and in a frenzy of rather excessive, and really unwarranted anger, the Hawaiians hacked and stabbed him to death at the shore — in Kealakekua Bay.) They have since erected a white marble monument in a remote corner of the bay to commemorate the great navigator). The monument wasn’t too inspiring for the kids, so the story behind it added a bit more incentive to paddle across the bay to see it. We packed a bunch of cold cuts, bread, water and enough muchies for lunch and headed out about 10am. Paddling our way across the deep blue water was wonderful. We had three kayaks — a single for Ryan and two doubles. Unfortunately there were the kind of open "ocean" kayaks that are very slow. Ryan’s kayak also had a messed up back rest so he got very uncomfortable quickly. He grumbled and moaned but we eventually made it across to the monument. Once across the bay we pulled the kayaks up on shore and started snorkeling. It was an amazing place for seeing fish. There is a coral reef next to shore and then a steep ledge where schools of fish would hover. Even though we had found an easy way to rent kayaks, we weren’t alone in the bay. In fact there were several tour boats and groups anchored nearby. There were several hundred people snorkeling and swimming but it didn’t seem crowded. We explored for over an hour and then had our lunch near a tide pool under the shade of a mangrove tree. After finishing lunch we followed a path over to the monument. Took a quick look the plaque and then headed back into the water for more snorkeling. Eventually we got water logged and packed up our kayaks for the trip home. This time Sue took he single kayak and Ryan seemed happier, although there were a few incidents and frustrations with the paddling style of his partner (Cal). As we crossed the bay Sue spotted an area where people were perched at the top of lava cliffs near where we launched out boats. We could see they also had cars. As we packed up we asked the kayak rental place how to get out to see. Of course it was through another one-lane lava field. This one wasn’t nearly as bad or as long as our bumpy trek out to Champagne Pond a few days earlier. There were mostly local fisherman and some scuba divers. We found a spot to park and walked out. Sure enough there was place on the cliff where you could jump into the water. There were different levels ranging from about five feet high up to around 15 feet. Rusty tested the depth with a mask on first to ensure it was safe and then we started jumping into the green-blue pools from the lava cliff. Of course the first to test the water, and the air, was the mountain goat of the family — Roby. He was in within a matter of seconds after getting the OK. We all tested the 5 foot spot and quickly wanted to progress up to the higher levels. Within two dives we were all jumping off the 15 foot ledge. Roby also discovered a more efficient way out of the rocks so we didn’t have to swim around to a shallow rock about 50 feet away. The jumping was invigorating but we finally hit our limit of sun and water and piled back into the car for the 30 minute trip home. We were tired and decided to find a movie for the evening. We went to Wal-Mart again and got a bargain bin edition of "A Beautiful Mind" on DVD. We watched it together and finished off the last of the hot dogs, tuna and salad. We also organized our bags in preparation for our early morning flight to Kauai. Once again the sunset off our porch was amazing. 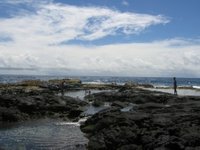 Kona is very popular tourist area because it’s on the sunny side of the island. It’s in the "shadow" of Mauna Kea so it gets much less rain. It also has the benefit of being on the west side where the sun sets over the bay. We started our day with a short drive up to Kahalu’u beach. Based on appearances, our assumption was that it would be an underwhelming experience. The beach is right along the main drive in the tourist area. We put on our snorkeling stuff and headed off into the water to explore. We were immediately surprised to find a wide variety of marine life including many bright colored fishes, and our first encounter with a sea turtle! Roby was especially excited and enjoyed swimming along side of the turtle. There were lots of coral formations and very calm water. It was a great way to shift into a new mood for Kona. 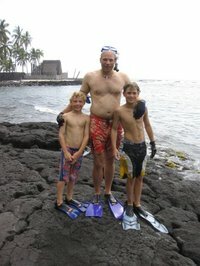 Exploring at Kahalu’u was fun but it made us realize that we had some shortcomings in our snorkel equipment. Ryan couldn’t move around very quickly in just beach shoes and two of our masks were leaky and poor quality. Rusty ended up with sea urchin spines stuck in his finger so we figured some gloves would also be a good investment. After an hour of swimming we headed off to a local scuba shop to see if we could upgrade our equipment. We bought two new masks at an outdoor market and looked for flippers for Ryan, but they didn’t have any of the right style. It turned out that the only place to get the right equipment at the right price was Wal-Mart. Walking into a bustling Wal-Mart on a Saturday afternoon in Kona seemed a bit odd, but we found just what we were looking for — two new sets of flippers and an additional pair of gloves. We decided to head south to explore some other beaches and bays. 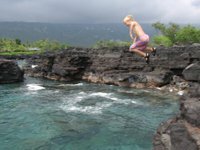 We stopped for lunch along the way and learned of a route that would take us past Kealakekua Bay and over a one-lane back road to Pu’uhonua O Honaunau National Park. (At lunch we happened to meet a nice Hawaiian who explained that the Hawaiian language has only 15 consonants which explains why all these names are so darn hard to pronounce and distinguish from each other). 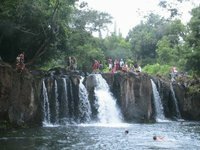 The National Park is a historic location where tribal chiefs lived and ruled the islands. It’several buildings, an outrigger and the walled village that was build in the 1500s (the wall is actually the original). The snorkeling in the bay was a bit more difficult because the water was choppy but there was a lot to see. There were deep holes in the coral reef — perhaps 30 or 40 feet deep — with lots of colorful fish. We also got to swim with several other turtles both in close to the shore and out in the deeper water. It was a lot of fun but we had a difficult time lasting more than an hour in the sun and waves. We explored the village a bit after snorkeling and then headed back to Kealakekua Bay to just see the boats gathering in the late afternoon. We found a local who rents kayaks in the bay and that is our plan for the morning — take some food, our snorkels, and kayak out into the bay to see the Captain Cook monument and other hidden areas of this beautiful bay. The evening was once again mellow. 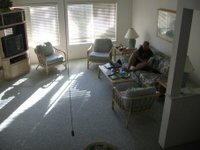 After a quick dip in the pool near the condo we had dinner and watched some TV while the sun set. Here’s Cal enjoying a relaxing moment watching TV basking in the glow of the sunset. Every vacation has transition days and down days. This was a down/transition day. 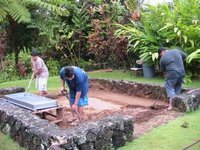 After all of the activity and excitement the day before we were all very mellow and a bit sad to be packing up to leave the house in Hilo that had provided so many incredible surprises. 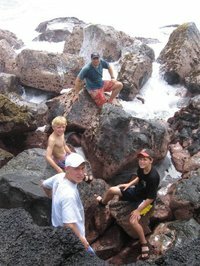 Rusty and Cal hiked down to swim in the tide pools one last time before moving on. It was fun, but it didn’t measure up to the discovery of the day before. The tide was lower, it was overcast and there were some locals picking mussels off of the rocks so it was no longer quite as secluded (although two guys picking mussels didn’t make it crowded; we no longer had it all to ourselves). This time we brought along face masks so we were able to see the fish. So that aspect was fun. 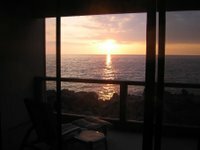 We were scheduled to spend our next three nights in a condo in Kona — a resort town on the west side of the Big Island. We decided to travel to Kona via the north road instead of down around the southern tip which would have brought us past the Volcano for a third time. We figured it would be good to see something new. It was fun to see the lush green hills and valleys that are part of the northeast coast. There were thick eucalyptus groves and even cattle farms. For some reason seeing cows in Hawaii seems a bit strange. The trip is about 120 miles and we figured it would take us about 3 hours. We lost time early on looking for a Quiznos sub shop in Hilo. We promised the kids a special lunch along the way and they had seen a Quiznos when we first drove up route 11 from the airport. For some reason this time around we just couldn’t find it. We had to make due with rice cakes and crackers to settle their stomachs until we came to the next town of any size. That came about 90 minutes later. We had lunch at Subway and a deli at a strip mall. It wasn’t very good and it took up another half hour of time. Right after that we entered North Kona county and immediate got stuck in a traffic jam. We left Hilo at noon and we didn’t make it to Kona until 4pm. When we drove through town, everything looked so different we were already missing our private house in Hilo. There are huge resorts, fast food, Wal-Mart, restaurants, and worst of all, traffic jams. We had gone from an undiscovered region to a very discovered region. We looked at row after row of condos and got nervous about the place that we’d be staying in. Luckily our place was about 5 miles south of the main tourist area. 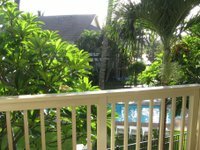 It turned out to be a cookie cutter condo, but it is at the end of the development and has a great water view of Kona bay. It also has a fancy granite kitchen, a porch, and two nice bedrooms. If this had been the first place we saw in Hawaii we would have been thrilled, but we were still having trouble comparing it to the Turtle Reef house. We shopped for food and bought pizza to eat in the room as we watched the sun set. The kids watched some junk TV for an hour or so and we were all asleep by 9:30. The 40 mile drive back up to the volcano seemed longer this time because we had already covered this stretch of road a few times. This time we were well prepared with a few gallons of water, flashlights, rain coats, sweatshirts and food. The plan was to hike through one of the older calderas — a hike described as amazing by all of the guide books — and then drive the additional 20 miles down to the ranger station at the shore so we could watch the lava flowing down the mountain from a distance at night. When we got the park center we were in the same misty rain we had experienced the day before. We described the hike to the kids and they didn’t seem psyched to walk four miles through a random part of the park. The were still most determined to find a way to see — up close — red-hot lava. The park rangers at Volcano National Park must be trained to be evasive about how and where to see lava because it was hard to get straight answer on the chances of seeing flowing lava. 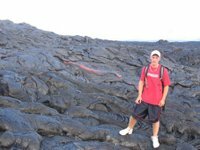 Finally, the younger guide, Vance, who had given us an introductory tour the day before told us that there is a field of flowing lava but it requires a six mile hike (three out and three back) out through the trail we had been on two days earlier. Six miles through jet black, crumbled, cracking, glass-covered, lava sounded a bit difficult but the kids were determined. So we filled up the backpacks with all of our water, our flashlights, and some powerbars and headed out the trail. We started by 3:30 so we were sure we could be back to the ranger station by dark at 7:30. 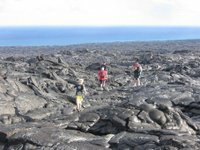 The kids, who were too tired to consider a four mile hike on a regular trail just 30 minutes earlier, were now bounding their way through the lava. The trail is first marked with yellow stickers on the ground and then it switches to "beacons" which are small yellow lights on a pole. There are four beacons along the trail up to the lava flows. They’re not easy to see and spread very far out. We made it to beacon zero (like I said, I don’t think the park rangers were into positive incentive) in about 30 minutes. We felt pretty good. We were also motivated by what looked like smoke along up on the ridge near where the trail was heading. Beacons 1, 2, and 3 were in a line near the shore and then we turned left up the hill off any marked path. 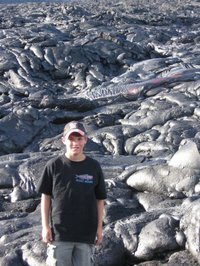 The lava was mostly dark black with glass-like coating that cracked as you walked over it. In some places there were flows with folds like a bed-spread nearly bunched together. In other places the lava changed to jagged rock that we did our best to avoid. The most disconcerting was a flat area that looked like a river and big chunks broke under our weight as we walked — just like trying to walk across a frozen pond with very thin ice. There weren’t may people out this far and we still weren’t sure that we’d be able to see anything once we climbed to the top. We pushed on up the ridge. We couldn’t really see it from below, but the "ridge" was in fact a very steep hill of lava that we had to climb up very carefully. The weather was also being good to us. It was overcast with a strong, cool sea breeze so we didn’t have to drink water as often as the other day. Our two gallon supply was holding up. (By the way, the rangers recommend carrying three quarts of water per person, which means we should have been carrying close to four gallons — so we were still undersupplied based on the official rules). Once we got to the top of the lava mountain we could see a group of people bunched on the hill. We took this as a good sign. There must be something to see for people to be bunched in one place. Suddenly the kids moved ahead of us and picked up the pace. They were far ahead of us and started waving frantically for us to catch up. They had spotted a red glowing "cave" of lava just a few hundred yards ahead. As we got closer we could feel the heat all around us. At 2000 degrees the lava makes the whole area feel like an oven. Fortunately the breeze was still strong and kept the heat from being unbearable. WE finally reached the point where we saw the glowing red. There was a blob of lava making its way out of the ground very slowly. It would expand up and then flow slowly down like a drop of semi hardended elmer’s glue — except many thousands of pounds, glowing red, and so hot you couldn’t stand near it (OK, so it wasn’t that much like Elmer’s glue). Another hundred yards up the hill there was another spot of lava that was oozing down the hill side. This one was more of a flow — we could see it making the distinct wavy curtain/bedspread shape that we saw so many times hiking up. After congratulating ourselves for our success we turned back for the 3 mile trek back to the ranger station it was 5:30 so we were right on schedule. We decided to be "smarter" this time and take a different route. Rather than head straight down the hill and then along the shore, we could make the hike much shorter by just heading in a straight line toward the ranger station which we could see from our high vantage point. We even saw two rangers heading that direction so we figured it would be a good plan. We were wrong. After just about 10 minutes we came to the top of the lava mountain we had climbed on the way up. This time because were further to the north than the path, the mountain was a sheer cliff rather than a passable incline. It was like standing at the top of the chutes in Steamboat but on hard black lava. We saw the rangers at the bottom of the hill and they explained that they had gotten off course and they advised us not to attempt coming down. 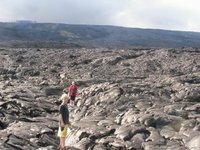 We had to traverse across the ridge through a field of razor sharp jagged lava — unlike anything we had seen on the way up. One slip would mean certain death. OK, that’s a bit dramatic, but we certainly would have been badly cut up. Luckily with careful steps we made it through and to a point where we could get down the ridge. 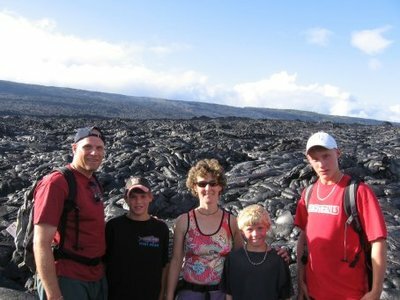 We were relived to be back on the familiar black lava with only a huge crevasses and sharp glass chips everywhere. We had made it to relative safety. We altered our course back down to the shore. We ended up at beacon 1 so we had actually cut off some of the hike. Within a half hour we were back at the beginning of the access road and joined hundreds of people preparing to see the lava as night fell. We didn’t expect the night show to be anything compared with seeing the lava up front. Once again we were wrong. As it got dark, we could see glowing lava all over the hillside — near where we hiked but also further down the shore where the flow was entering the ocean. As it got darker we could see a lava fountain spraying up into the air just above the ocean entry. Even though we were miles away, it was amazing to see. We headed back to the car, drove a few miles back up the access road and stopped at a place were we could still see the glowing red and made sandwiches for the hour drive home. The kids fell asleep during the car ride and fell right back to sleep after we made to the house. It was a long strenuous day, but a lot of fun. After a nice day of exploring Hilo and the tide pools on Wednesday, our goal for the day was to venture back up to the volcano in the afternoon for a hike and to watch the lava at sunset. We decided to use the morning just to enjoy our house and explore the area. We put on our bathing suits and packed the camera and headed along the volcanic ledges to the east of the house where there is no development. We had the shore to ourselves and climbed around in every nook and cranny discovering all sorts of sea life. The most plentiful things were things were purplish things that stick to the rocks like barnicles but are shaped more like sea urchins but don’t have any spines. We’d never seen anything like them before. There were also lots of sea urchins with spines. 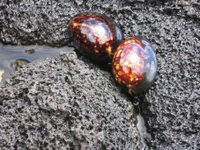 We also found some deep brown sea snails — the kind that the use to make jewelry — between the rocks in one of the inlets. We found five so we could each take one home. We moved further down the shore and it started to rain — really hard. Our clothes got soaked and it felt cold in the morning wind. 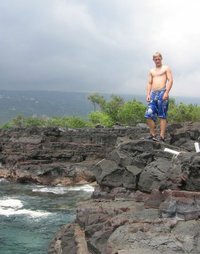 The next segment of shore was huge lava boulders that were hard to climb over, especially after the fresh rain. We made it through this section to a point that jutted out into the ocean. We scanned the waves for a few minutes hoping to be lucky enough to see a sea turtle or two as we had on our first day. We planned for this to be the end of our hike, but we could see a flat area in the distance with tide pools. And the bright sun had magically reappeared. We we walked another few hundred yards to get there and discovered a series of interconnected tide pools teeming with fish, coral, sea urchins and crystal clear water. The pools were at different levels so the water flowed like a river from one to the other. The outer pools were within range of the breaking waves so they were filled up with water and bubbles with each crashing wave. 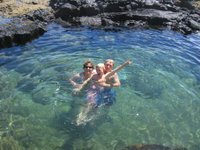 We found two tide pools that were deep enough for swimming (and clear enough of sea urchins to be sure that we didn’t get poked). We jumped in and floated in the salty warm water. The kids jumped from the side and did cannon balls. We had found our own private swimming hole — not a house or a person within site. Within the pools bright colored fish darted around looking for a "safe" corner as we were swimming around. We moved further out to the edge toward the breaking waves and could swim in a pool with sea foam spraying around and waves filling up the pools.